When William Arthur creative director, David Evans, attended a Hallmark Creative Summit last year, he found guest-speaker, Jeffrey M. Sparr, to be just riveting! Jeff, the founder of PeaceLove Studios, bared his soul onstage as he spoke of his own Obsessive Compulsive Disorder [OCD] problems and how art has saved his life. Sparr, the owner of a successful manufacturing business in New England, founded PeaceLove Studios to connect people affected by mental illness with creative expression. PeaceLove welcomes the public to free workshops at its studio in Pawtucket, RI—and through sales of merchandise and support from its partners—brings immersive art programs to senior citizens, boys & girls clubs, and communities affected by mental illness. While David was listening to Jeff tell his story, he drew a picture of him onstage and a week later, mailed the torn page from his notebook to Jeff. It's fitting that our partnership with PeaceLove Studios began with a drawing! Since then, we are delighted to have created a Decorative Hearts Card for this holiday season that will benefit the programs at PeaceLove Studios. We look forward to more collaborations with PeaceLove to help Jeff further his mission of growing a community of mental health advocates and artists who create conversations of acceptance, understanding and hope. To learn more about PeaceLove Studios, please visit their website or click to see a video of Jeff conducting a workshop. 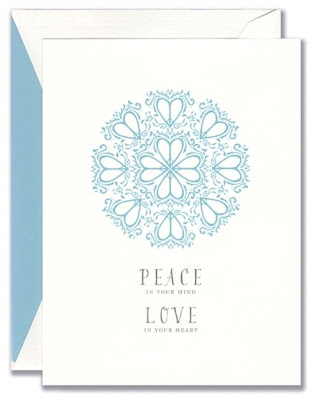 The Decorative Hearts Boxed Holiday Cards are boxed in sets of 10 cards with 10 light blue-lined matching envelopes. Please Note: The wonderful artwork for the Decorative Hearts Holiday Card was created by Providence artist and PeaceLove advocate, Jillian Clark. Your Christmas Card for PeaceLove was done by a Providence Artist named Jillian Clark and I dont see any acknowledgement for her. I hope this is not being passed off as someone elses work. Providence Artist, Jillian Clark did, indeed design the artwork exclusively for PeaceLove Studios, creating a positive symbol for mental illness. Added Here: We are delighted with our PeaceLove Studios partnership and to work with many of their talented friends, like Jillian Clark. Thank you William Arthur for introducing me to PeaceLove. I'm so impressed with Matthew Kaplan's commitment to helping others pick up the brush, explore, and find peace and love within their own masterpieces! 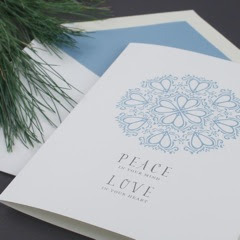 Great video and what a beautiful card Jillian has created for your holiday collection!